At the beginning of July last year, I started going to my local running club. My running buddy at work had just gone onto maternity, and I felt like I was getting into a bit of a rut. They're based out of the shop at the gym where I'm a member, and I'd seen them go out several times in the past, so I thought I would give it a go. I registered, turned up and, almost before I knew what was happening, the length of my average trot was up by a good mile and I was running further or faster than I did on my own. The club runs a loyalty scheme, where you get a card and get the card stamped every week that you attend. After five stamps, you get a club t-shirt in glorious yellow; after twenty-five, you get a nutrition pack; after thirty, a "lifestyle t-shirt".... you get the picture. The card is only valid for 365 days, so you have a total of fifty-three weeks to work your way towards the grand prize, awarded on your fiftieth week, of a Garmin GPS watch, apparently worth £249.99. To be honest, it felt like a bit of a remote possibility when I started. And in any case, I like to listen to music when I run, so I carry my iPhone strapped on my arm to play some tunes. For the last few years, I've also used it to track over 2,500 miles of running. I don't need a GPS watch to do the same thing. Unfortunately, I apparently have something of an obsessive personality. I don't need the watch, but there was a target to aim for and I went for it. I missed one week when we were in London for the Olympics, and another couple when we were skiing in Canada, but at the beginning of July this year, with one day to spare, I clocked my fiftieth week of attending runs with the club (there are several runs a week, but you only get one stamp). 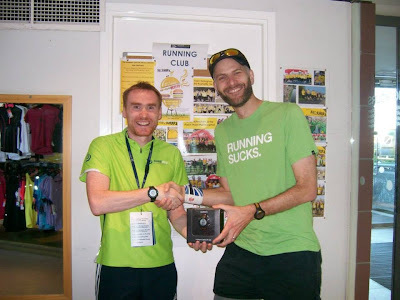 It's taken a while to get the watch, but it was awarded to me last night before the run. We're both smiling because Pete had remarked on my ironic t-shirt. "Oh, that's not an ironic statement, I assure you"
"Well, after attending 50 weeks in the last year at a running club, I assure you that it is"
I'm quite proud of myself. I've never been so injured as I have been over the last year: problems with my plantar fascia, my ITB, my knees and my calves have all taken their toll, but I'm too stubborn and stupid to stop running, and this is my reward: something I don't really need. C. tells me she's thinking about a loyalty programme for domestic chores. We're off to Devon for a few days of cream teas, excellent food and a family wedding in Tavistock. See you on the other side.